Crazy Frank won’t be undersold! A full page, full color ad for only $5,000? At that price, they could pretty much print nothing but full page, full color ads, and still not cover their costs. And don’t think the Times is making up the lost revenues online, where advertising opportunities now “start at less than $2.75 CPM.” That’s not much more per page view than I’m earning this month from Google Ads. I guess premium content demands premium ad rates. And vice versa. Hmmm, that’s almost tempting. Anybody want to go in on a half-page add detailing how the Republican party got us into this economic mess, and are now trying to falsly blame it on the Democrats? Put in the few pie charts showing that 2/3 of the deficits are directly due to Bush’s tax policies, and most of the remainder are due to the current rescession, and the Republican argument falls to shreds. 1:@rhp6033: Add commentary that relates it to our uglier state initiatives such that it has a local slant as well (and the need, as a result, for I-1098 to pass), and I’m in. But I’d prefer to invest in a full page. How about a “Tell the politicians in Olympia to stop giving tax breaks to newspapers” ad? Perhaps Blethen can post this as a Public Notice. Late yesterday, Gallup came out with new numbers on the generic ballot question—which party’s candidates would you vote for in the election for House of Representatives? Among registered voters Gallup shows Republicans ahead by 46%-42%, about as good a score as Republicans have ever had (and about as bad a score as Democrats have ever had) since Gallup started asking the question in 1942. However, Gallup also shows the results for two different turnout models. Under its “high turnout model” Republicans lead 53%-40%. Under its “low turnout model” Republicans lead 56%-38%. These are the same voters that will be voting against an income tax, for limited government 2/3 tax increases, for privatizing liquor sales..etc etc..And For Rossi! Bad year for Dems, but you know what, they deserve it ramming all their crap down Americas throats. I’ll buy a round at drunken Liberarally to help you through your misery. PS…Even Harry do nothing right Reid is in trouble now! # 6: Those generic polls have me wondering. I’ve seen other polling which suggests that most of the upswing for Republicans are in states which usually go red anyway, and it’s not nearly as bad in the blue or swing states. In other words, the Tea Party activists are bringing out their base to vote for Republicans who will usually win anyway. You can see this in the number of primaries where the Tea Party folks have knocked off established Republican incumbents. As for myself, I’m ignoring the red states, and focusing on the swing states. 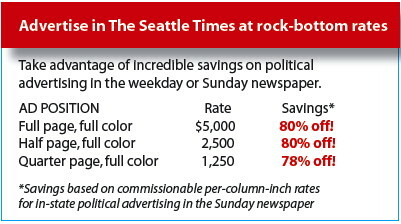 Given that car ads, real estate ads, and help wanted ads are the three mainstays of newspaper advertising revenues, I expect the Seattle Times itself will be for sale soon. Those rates aren’t nearly as cheap as the free, bogus attack advertorial the Times printed on Saturday’s front page on behalf of Rossi. P.S. Still waiting for you to address the Times hit-piece, Goldy. Their claim that the Murray campaign’s ad was “false”, and “wrongly depicted” Rossi’s answer to the question is itself false and misleading. The Times went on to make excuses for Rossi’s answer. The ad was accurate. Rossi looked bad because he didn’t understand the question and faked his way through the answer. It took two separate do-overs, over a period of days, for him to clarify his answer. The fact that it was necessary, upon further review and huddles with advisors, to change his answer to match Murray’s, is further proof that the Murray ad was legitimate. We’ve finally succeeded in persuading the Times to only deliver on Friday, Saturday and Sunday. The last three or four times my wife called them and tried to cancel the other four days, they dangled the offer of every-day delivery for the same price for another month (or two or three). This time, she firmly told them no thanks, period. Since then we’ve had two more phone calls from the circulation department and one visit to our door by the carrier asking us if we don’t really want all seven days’ worth of what’s left of the paper for the price of three, and each time we told them not only no but hell no. The last time they didn’t bother to ask why. Could be the representative wanted to get back to looking for another job. @11 The Obama Ponzi scheme? The Democrats’ “debt bubble”? HAR HAR HAR HAR HAR HAR HARHARHARHAR!!!!!! There may be an analogy here between Uncle Frankie nearly paying people to put ads in his rag (and almost paying customers to subscribe) and BushCo appointee Ben Bernanke nearly paying megabanks to accept more freshly-printed dollars. rhp is right. The red states are getting redder. The generic ballot polling cross tabs have been indicating for weeks that Ds are gaining in the far West where there seems to be no enthusiasm gap. Thanks for the tip! No doubt your unique and vastly under appreciated foresight and wisdom in this area has led you to short the bond market, no? Because the US 2-Year Treasury Yield Hits Record Low only yesterday. The two-year U.S. Treasury note yield fell to a record low of 0.403 percent on Monday after hints by Federal Reserve officials supporting more central bank buying of bonds to support the economy. The two-year T-note yielded 0.407 percent, down almost 2 basis points from late New York trade on Friday while the 30-year T-bond rose almost a full point in price to yield 3.676 percent, down 4 bps. Alternatively you are a teabagging yahoo whose knowledge of bubbles is limited to those you see in the mirror coming from your drooling lips while you imagine the person you see is scheming against you. Could it be the ST is feeling the effects of the Austerian policy his rag promotes to the determent of an economy with a huge output gap? Cover their costs? Surely you jest. Costs are for the “little people”. 16. And how are all the Public Pension funds going to continue to pay out their generous lifetime benefits when the trust fund is earning .403? Through the miracle of tax cuts, deregulation and an endless war on terrorism, of course. Cannot sell ad space in a newspaper that nobody wants to read? Is that capitalism at work? Art @ 12: Congratulations. Obviously, the times is trying to inflate it’s paid subscription numbers in order to keep advertising rates higher than would be justified otherwise. My own experience with the Times confirms that they pretty much will give away subscriptions, as long as they can make some specious argument that they are “paid”. Last winter they offered me three weeks of paper on a trial period if I agreed to sign up for a subscription to pay for weekends only after that. But the catch was that the payment was unenforceable, it came with a “cancel at any time at no charge” promise. So if I wanted, I could have gotten three months free, and then canceled at no charge. Oh, and a cute umbrella with a cartoon imprint to boot. But I still said no – we don’t need more newprint to add to our recycling tub.